Around 50 Square Feet But Usually Less: There is no design council defining how big a half-bathroom should be. Generally, it is 50 square feet (total room size, not just walkable floor space). More often, it is just big enough to be able to walk from the toilet to the sink: about 16 square feet. Small Bathroom With No Bathing Facilities: A full-service bathroom has as many as 4 services: 1.) Toilet; 2.) Sink; 3.) Bathing facility (shower, bathtub, shower/tub combo, or shower and tub). Thus, a half-bath has half as many of these services. Half-bathrooms are a blessing in disguise. Because there are no bathing facilities to deal with, your job is cut in half: no shower, no bathtub, no extensive counters. Floor space is postage stamp-sized. Different Names For It. Powder room or guest bathroom are names often attached to it. But as long as it has no bathing services, it is a half-bathroom. Half bathrooms are indeed small. But this allows you to hone your bathroom design skills on the half bath before proceeding to the master bathroom. For another, remodeling your half-bath will not impact your life as much because you are not decommissioning any bathing facilities. This allows you more freedom of time to finish the work. However, it should be pointed out that guests will have to use your main bathroom while the half-bath is being remodeled. One solid bit of feng shui advice: do not position the half bath in the center of the house. Instead, make sure that one of its walls is an exterior wall of the house. There are good reasons for this. First, any window-less room feels oppressive. Second, it is not a great idea to position a room where people perform, well, personal activities within a larger area where people are cooking, reading, watching TV, and so on. If you cannot move the half-bathroom to the house perimeter, you will learn to live with it; it's just not the preferred arrangement. A high-velocity fan is necessary for the half bath because this room tends to be situated near living areas. Strangely enough, building code does not currently require that your half-bathroom have an extraction fan. As long as you have 3 square feet of window to the outside, you do not need a fan. And that window only needs to be half-openable. Building code aside, you should install a quality, high velocity fan in your half bathroom. Large tiles in small bathrooms actually make them seem larger. 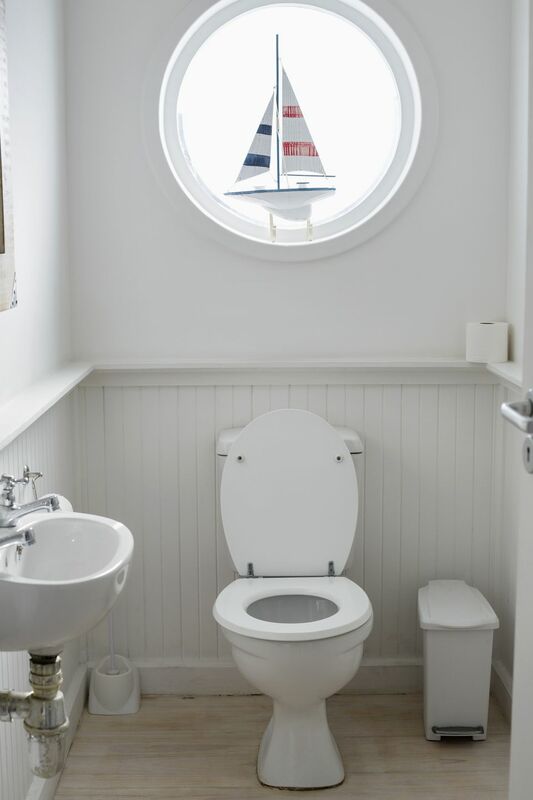 Some feng shui experts say that positioning the toilet so that it is facing the doorway is a bad idea. Feng shui or not, this tends to be solid design advice. Pedestal sinks are one great way to maximize room. Cabinet-style sink bases not only take up floor space but feel ponderous. You really don't need to store anything in the half bath, anyway. Store cleansers in another bathroom or in a laundry room cabinet. Over-adorning your half bath only leads to clutter. Besides the toilet and pedestal sink, keep other items to a minimum. Maintain a majority of neutral-color surfaces (flooring, walls, etc. ), but that doesn't mean you can't have a bright accent wall. Dark colors are imposing and make your bathroom feel smaller.